Source: Compiled by Homecoming II Project 15 from one or more of the following: raw data from U.S. Government agency sources, correspondence with POW/MIA families, published sources, interviews, Senate Select Committee report. Updated by the P.O.W. NETWORK. The Phantom, used by Air Force, Marine and Navy air wings, served a multitude of functions including fighter-bomber and interceptor, photo and electronic surveillance. The two man aircraft was extremely fast (Mach 2), and had a long range (900 - 2300 miles, depending on stores and mission type). The F4 was also extremely maneuverable and handled well at low and high altitudes. Most pilots considered it one of the "hottest" planes around. Reconnaissance Squadron based at Tan Son Nhut Airbase, South Vietnam. On April 16, 1970, an RF-4C with a two man crew of Major Ayers and Captain Rausch departed Tan Son Nhut Air Base, Saigon to conduct reconnaissance along the Demilitarized Zone separating North and South Vietnam as well as the adjacent area of Savannakhet Province, Laos. They refueled in flight and advised their controller that they were heading north to another target area. The new target area was known to be a high threat area with 37mm and other anti-aircraft weapons. They were last reported over Savannakhet Province but did not return from their mission and were declared missing in action. There were no chutes or beepers located. Subsequent to their disappearance, Radio Hanoi's domestic service reported its forces had shot down an RF-4C in the Vinh Linh Special Zone, the North Vietnamese side of the DMZ, on the afternoon of April 16, 1970. This report was correlated to the loss of Major Ayers' aircraft. were F-4 and the completely burned remains of one crewman were found in one F-4 crash site wreckage. The pilot of the fourth aircraft, an RF-4C, was also killed. The portion of this radio message dealing with the RF-4C was believed associated with Major Ayers' shoot down even though People's Army forces only reported (one) pilot killed. In the early 1970's the Pathet Lao stated on a number of occasions that they held "tens of tens" of American prisoners and that those captured in Laos would also be released from Laos. Unfortunately, that release never occurred, because the U.S. did not include Laos in the negotiations which brought American involvement in the war to an end. The country of Laos was bombed by U.S. forces for several months following the Peace Accords in January 1973, and Laos steadfastly refused to talk about releasing our POWs until we discontinued bombing in their country. Consequently, no American held in Laos was ever returned. By 1989, these "tens of tens" apparently have been forgotten. The U.S. has negotiated with the same government entity which declared it held American POWs and has agreed to build clinics and help improve relations with Laos. If, as thousands of reports indicate, Americans are still alive in Indochina as captives, then the U.S. is collaborating in signing their death warrants. During the period they were maintained missing, Richard L. Ayers was promoted to the rank of Colonel and Robert E. Rausch was promoted to the rank of Major. Barbara M. Rackley waited 38 years to put her first husband to rest. 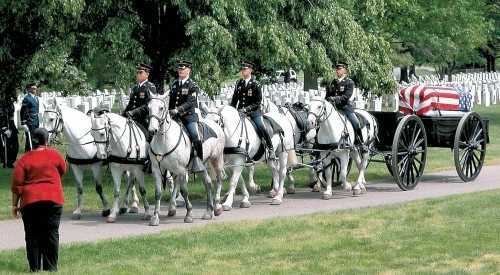 She finally did Friday — in Arlington National Cemetery, with a three-gun salute, the sound of taps playing from a distance and a horse-drawn caisson bearing an empty flag-draped casket. It also marked the second time the Vietnam War sent Rackley to Arlington, Virginia, to bury a husband. Her second husband was laid to rest there five years ago after dying from cancer that she believes was linked to his exposure to Agent Orange. But this latest memorial service was for Air Force Major Robert E. Rausch, a navigator on a reconnaissance jet who was shot down April 16, 1970, near the Laotian border, in Vietnam. His remains were never found. With her 70th birthday only a few days away, Rackley said it was time to tie up loose ends and pay Rausch a final tribute, one day after what would have been his 70th birthday. With the loss of two husbands who served in Vietnam, she can’t help but reflect upon the impact the war has had on her life. She was not alone in honoring Rausch’s memory. Their three children, along with family and friends, including several from Buffalo, stood together at the memorial site for the husband and father who had once dreamed of a career as a commercial airline pilot. 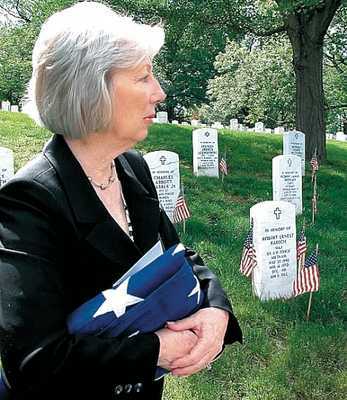 Barbara M. Rackley paid tribute at Arlington to her first husband, Maj. Robert E. Rausch. It was more than the passage of decades that moved Rackley to secure a final home for him in the hallowed ground of the nation’s best-known military cemetery. Several years ago, the government located several objects indicating where the RF-4C jet crashed in a mountainous region of Vietnam. “They excavated the site and found no remains at all,” she said. In August, Air Force officials told her that they had located a possible witness to the crash, and Rausch’s case was changed from “no further pursuit status” to active case status. “That was a pleasant surprise, but nothing has come of it as of yet. These things take time, and I am not getting any younger,” said Rackley, who now lives in Huntsville, Alabama. Unlike some who have visited Vietnam to come to terms with what happened, she says she has never felt that need. “I cannot bring myself to do it. My second husband served over there as an Army aviator, and he had an interest in doing that. But I just could not bring myself to do it,” Rackley said. She married Major Robert Rackley a few years after Rausch was declared legally dead and the government issued a declaration that all of the POWs from Vietnam had been returned to the United States. “Once the POWs came home in 1973, I knew there was no hope. I had sent packages for a couple years to North Vietnam with necessities, but they always came back,” she said. That grim reality helped her restart life and marry Rackley, a decorated helicopter pilot, whom she had met through mutual friends. They eventually settled in Snyder, and he taught military science at Canisius College. But tragedy again visited after many years of happy marriage. In May 2003, her second husband died. A recipient of the Silver Star for heroism during his two tours of duty in Vietnam, he was buried in Arlington. “I always said it was Agent Orange that caused his lung cancer. He flew missions to take out the wounded and the dead,” she said. Barbara Rackley says she has carried on, believing something bigger than her was at work guiding her life. Still, there are painful moments forever frozen in her memory, such as when she received word her first husband was missing in action. “Two Air Force officers from Niagara Falls Air Base came and knocked on my door in Hamburg. I felt so sorry for those two men when they told me why they were there,” she said. Harder still was witnessing the reaction of her children. “My oldest, Michael, just never talked about it. My other son, David, was always asking for his father. ‘When’s he coming home?’ and ‘Is he coming home?’ ” she said of the boys, who were 9 and 5 years old at the time. The other child, Betsy, was 2. Harder also remembers the plans she and Rausch had made for their future. Following his one-year tour of duty in Vietnam, he would go to work as a pilot for United Airlines. After she received the bad news, she remembers how family and neighbors were there for her, especially Ellen Cooper. “Ellen’s brother Richard Stratton was a Navy POW in Vietnam who came back. That was a bright spot. He retired as a captain,” Rackley said, recalling that Cooper, to this day, is someone she can depend on. Cooper was with Rackley in Arlington National Cemetery at 3:15 p. m. Friday as a team of soldiers folded the flag that had arrived by horse-drawn caisson and handed it to her. It was a solemn moment, but Rackley was not about to let the solemnity get her down. “I’m going to be buried at Arlington someday with my second husband, and I’ll be there forever to harass them both,” she said, breaking into laughter.